A new look at the sonnet "221B"
Written in 1942, Starrett's famous poem is given new life in an e-book of translations. Sora Reye's cover for Translating Vincent Starrett's Sonnet "221B"
It’s not often we get to welcome a new book involving Vincent Starrett, but we now have Maria Fleischhack and The Baker Street Babes to thank for a happy addition to the Starrett canon. It is very welcome publication indeed. Maria has assembled 31 different versions of “221B” included here, in 20 different languages. As she explains in her preface, the inspiration for this project came when she was casting around for a good ending to an introduction to Sherlock Holmes, and decided to use the last few lines from Starrett’s poem. The only problem was that Maria, who lives in Leipzig and was writing in German, would need to translate the sonnet. The Baker Street Babes is an international group, and so she set out asking for translations in as many languages as possible. This is not a simple task. “Translating poetry is extremely difficult. Decisions concerning form, style, the right connotation of the translated words, rhyme and rhythm have to be made,” she notes. And there is this: Starrett used the sonnet format, which in its traditional form has a very set rhyme scheme and metre. Maria believes this allows the translator to be highly thoughtful about the final product. “In that sense, things are not necessarily lost in translation, but gained,” she notes. The musical setting for "221B" by Jim Ballinger. The translations start off with one that is not in a different language, but a different mode: Jim Ballinger’s musical setting for the poem. This is a reprint, actually, since it first appeared in Ballinger’s Singalong with Sherlock Holmes back in 1995. Yet it is welcome here, since humming the tune (which I do silently, in deference to my family) gives new meaning to the familiar words. This is a delightful addition to the extra-Starrett canon, a tribute to the drive of the editor, the commitment of the translators and the affection that the original continues to generate around the world today. I was honored to be asked to write a foreword for this unusual work, and tried to put the poem into its proper historic context. Born out of the greatest war mankind has waged, it is entirely appropriate that the poem should now be translated into 31 of the world’s languages. May it always be read in peace. Before we leave, I thought I would mention one other unusual treatment of Starrett’s remarkable sonnet. The late Bruce Holmes issued a number of pamphlets crossing his two hobbies —Sherlock Holmes and stamp collecting—into one project. 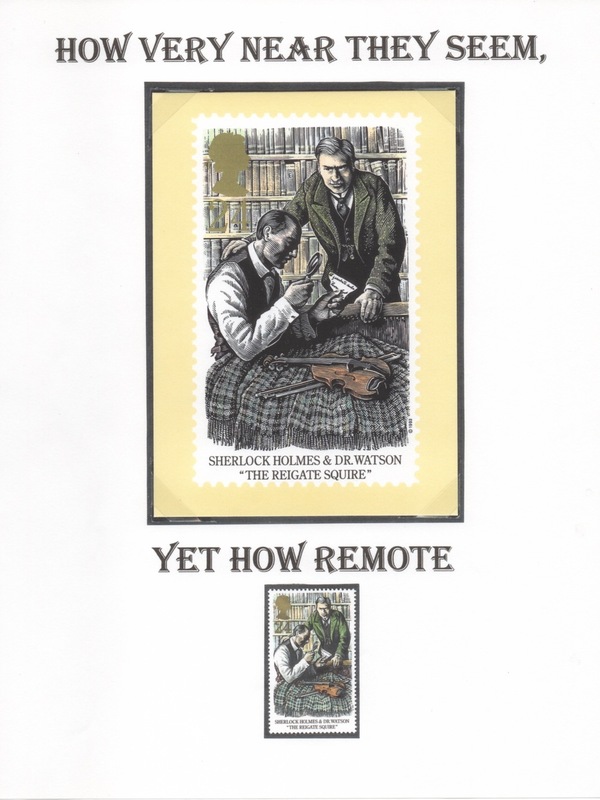 Back in 2004, the Canadian philatelist produced a version of “221B” with each line illustrated by a stamp or stamp-related item. 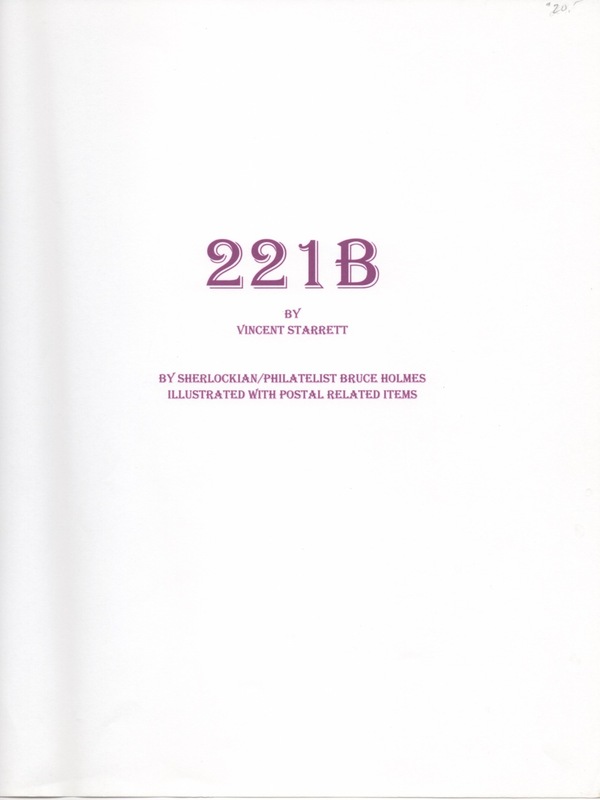 It is a singular effort, clearly done out of love for the master detective, the poem “221B” and stamp collecting.